Kewaza is a blend of wholesome and delicious flavors packed with raw, simple, all-natural ingredients combined in a flavorful dance to give you the energy you need to move mountains! The best Mother Nature has to offer squished into a little ball of awesome.These portable, flavorful, energy-packed bites will help you be at the top of your game. 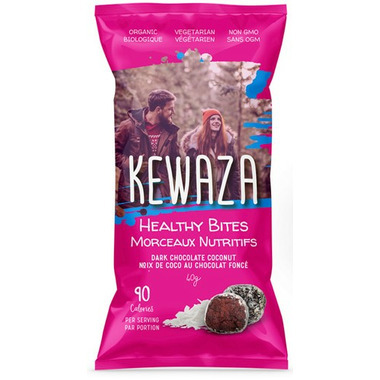 Kewaza Healthy Bites are a delicious way to enjoy clean organic energy from amazing superfoods like gojis, coconut oil and coco nibs. They are organic, under 200 calories, and contain fibre. They have no: dairy, gluten, soy, preservatives, GMOs, refined sugars or sugar alcohols. The dark chocolate flavours are also raw! Ingredients: Honey, cocoa powder, coconut oil, raw whole grain brown rice protein, goji berries, shredded coconut, cocoa nibs, flax seed, maca powder. I loved these! I was surprised there were only two in a bag, however, it was probably for the best because I wouldâ€™ve eaten them all regardless. They kind of remind me a big, chewy chocolate truffle, as someone had mentioned below the taste of cocoa powder. I really enjoyed this and will definitely be ordering more. Itâ€™s indulgent and healthy at the same time. I didnâ€™t notice being more full, though. It was more of a treat for me. An absolutely fantastic tasting little bite. This flavour is incredibly rich and incredibly sweet. I struggled to eat 1/4 of a bite because it was so overpoweringly rich. That being said, it has the texture of a brownie and if you're someone with a sweet tooth, you'd hardly be able to tell that this was "good for you." Will definitely repurchase, but I might try some of their other products first! Great quality and flavour - just keep a glass of water on hand, because it's super sweet. Great ingredients but it's a little too sweet for me. I should've known better because honey is their first ingredient. I ate 1 ball before I went hiking and I felt fine so maybe it did help with my energy. I recommend that you eat all of it the same day because I ate the other ball after a few days and the package smelled bad. The few day old ball tasted fine but the pkg smells sour. Great snack very yummy! Wish there were more in a package. Pretty good, definitely does give you a shot of energy, so it can get you through an afternoon slump. Sorta tastes like I am eating cocoa powder right out of the bag....just in ball form. Deep, rich chocolate flavour. Two per package. Although they do appear small, one is sufficient at a time as they are quite filling (especially if eaten slowly to savour them). Delicious chocolaty snack! Will definitely buy more. Very yummy chocolate taste. Only 2 per pack so may need to buy more if you enjoy them. MMM good;) if you love chocolate you will love theses 'Chocolatey Good' treats. But warning - only two in a pack so buy lots.